Oh yes, this is the right time to share spicy biriyani. Do you know how to make delicious biriyani? 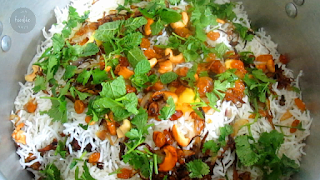 Always I think early days biriyani is a heavy food and very difficult to make. Nothing to worry about biriyani. I think now I am an expert to make dum biriyani. I make this biriyani with kingfish, also known as aiykoora and in Malayalam it is called Neymeen. Ginger and garlic-1 tablespoon crushed. Fish-King fish(Ney meen) Cleaned cut into medium pieces.750gms. Water as required for cooking rice..
Pineapple essence-2 teaspoons. or chopped pineapple. Heat a pan with 2 tablespoons of oil. Add ginger garlic paste. Saute for few seconds. Add green chillies and curry leaves. Saute for few seconds. Add chopped onions and salt. Saute until onion becomes translucent. Add turmeric powder, red chilli powder, coriander powder, fennel powder and garam masala powder. Combine well until raw smell gone. Add chopped tomato and cook the tomatoes. Add coriander leaves and curd/yoghurt(if using). Combine well. Keep this aside. Wash the measured rice and soak them for 15mins. When the rice is partially(75%) cooked turn off the flame and drain the water from it. Next put 1/3 of the cooked rice and spread this. Spread some ghee, pineapple or pineapple essence, sprinkle rose water, fried nuts, onions, raisins, coriander leaves and mint leaves. Repeat this layering process for one more time. Cover it and seal tightly. Place a flat cast iron skillet/ tawa on the stove. Then place the vessel for dum. ( Very low heat)Wait for 20 to 25 min... Awesome biriyani is ready... Serve it with pickle, onion raita & Papad.